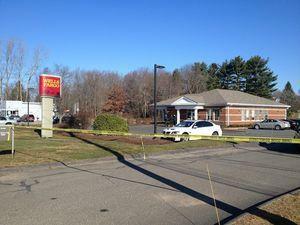 PROSPECT — Two armed men, wearing black hoodies and gray pants, robbed a Wells Fargo Bank at 66 Waterbury Road on the morning after Thanksgiving, state police said. No injuries were reported in Friday’s robbery, according to the Connecticut State Police’s public information office. As of late Friday afternoon, the men were still at large, state police said. The first call came in at 9:24 a.m. The two suspects displayed handguns, demanded cash from a teller and escaped with an undisclosed amount of money, Connecticut State Police spokesman Lt. J. Paul Vance said. They fled south on Route 69 in a tan car, possibly a Mercury Sable, with a partial registration plate of 676, state police said. Vance said state police are following leads, and there are a lot of witnesses and information they are pursuing. Yellow police crime tape cordoned off the bank entrance and exit after the robbery. Later Friday morning, at least six police vehicles, including state and Prospect police, were parked at various spots around the bank, which is situated off the busy Route 69. Authorities alerted police departments in surrounding towns to be on the lookout for the men. This is the same bank branch that was robbed by two armed men on March 26, 2011. In that incident, authorities charged Kevin Shuff and Terrance Phillips, both of Waterbury. According to the state Judicial Branch’s website, both men pleaded guilty to a charge of first-degree robbery with a deadly weapon. Shuff in June 2012 was sentenced to 18 years in prison, while Phillips in March 2012 was sentenced to 12 years in prison, online records show. No one was injured in that incident, authorities said. State police had no further description of the suspects in the latest robbery available by later Friday. State police are looking for any more witnesses who may have seen something just before the robbery or immediately after, Vance said. Anyone with information can call Troop I in Bethany at (203) 393-4200. This happened Friday, Nov. 30th, 2018. The quote below concerns me. IS it possible to have some kind of description of the suspected perps? Is this the politically correct game being played here in Prospect. I don’t “get it” and I wonder how many others in town “don’t get it”? What information is being withheld and WHY? This is ridiculous!